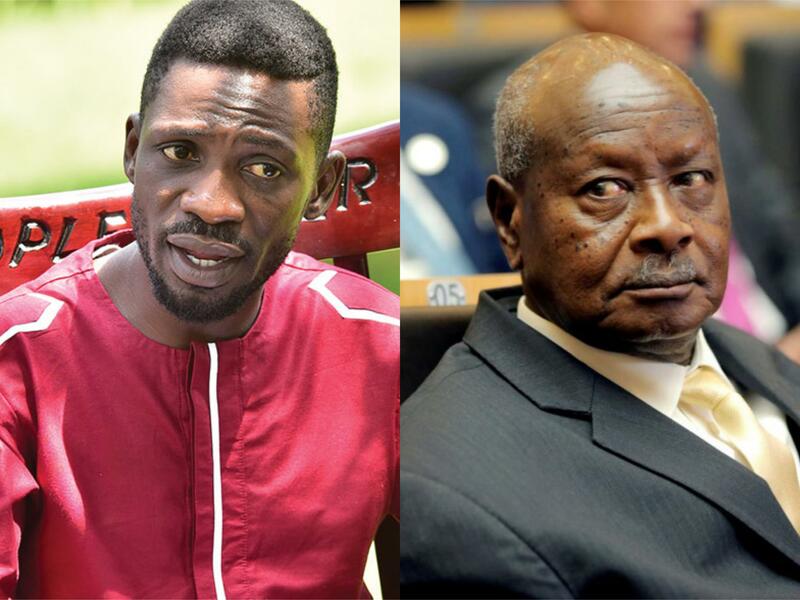 KAMPALA – Kyaddondo East Member of Parliament Robert Kyagulanyi Ssentamu aka Bobi Wine has detailed a plan to end long time serving President, Gen Yoweri Museveni who he accuses of presiding over a-three decade of iron-fisted rule. Bobi Wine has also responded to critics against his ‘get your national ID campaign’ dissecting several issues and offering alternative views to how to perceive present socioeconomic and political state of affairs in the country. Bobi Wine in a detailed dossier says much as President Museveni and his NRM party are planning to stop him from running for presidency in the 2021 elections, he and other democratic forces, are determined to end a-three decade of iron-fisted rule. In an April 12, dossier on social media, Bobi Wine has also tackled a wide range of issues on the economy, state of affairs among others including re-emphasising his ‘get your national ID’ campaign. On the opposition strategy, Bobi Wine says; “Firstly, we believe that the citizens of Uganda have a right and duty AT ALL TIMES to defend the Constitution of Uganda which Museveni has violated, abrogated with impunity and amended contrary to its provisions. It will be remembered that Article 3(4) of the Constitution bestows upon us, as citizens, the right and duty to do everything within our power to restore the constitutional order which has been violated- at all times. He adds that if President Museveni fell today, the next step would be to demand free and fair elections within six months. “If Museveni fell today, what would be the next step? The proper thing to do would be to demand free and fair elections within six months as required by Article 109(2) of the Constitution,” he added. Bobi Wine has also responded Dr. Kizza Besigye, a four-time presidential candidate; after comments that former president of the Opposition Forum for Democratic Change, is an obstacle to change. “I am persuaded beyond doubt that comrade Dr Kizza Besigye has won at least two elections in the past and was rigged. But I also know that the win was not as decisive as it ought to be if we confronted the despot as a more united and prepared front,” he said. But writing on his Facebook page, Bobi Wine, a musician turned – politician whose methods have been criticized by FDC, left Dr. Besigye and more FDC leaders embarrassed than bemused, dissected the FDC concerns on get your national ID issue by issue, greeting with some points raised while differing from others lecturing opposition on what ought to be. If there were any doubts that Bobi Wine has arrived on the political scene, then this statement put them all to bed, in effect, saying a boy who has washed his hands can eat with the longtime opposition leaders. UNDERSTANDING OUR ‘GET YOUR NATIONAL ID’ CAMPAIGN IN THE CONTEXT OF THE SUDAN AND ALGERIA UPRISINGS. I have seen a few comments on social media seemingly wondering how our call on the people to register as voters will rid Uganda of dictator Yoweri Kaguta Museveni. Some have raised doubts that an election, organized by Museveni’s controlled Electoral Commission can rid our nation of Museveni and Musevenism. Indeed, there are some comrades who have suggested that we should forget about 2021 and kick Museveni out of power before the end of 2019- Algeria or Sudan style. These are legitimate voices and we completely respect the viewpoints. I am happy that despite the real or perceived differences in strategy, there is one constant- all of us acknowledge that it is time for Museveni to go, like all the other despots before him. To me, agreeing on this fundamental point is very important. Let me use this opportunity to clarify a few things. To begin with, we are not naïve. We are fully cognizant that Museveni has rigged the past elections with impunity. There is no doubt whatsoever that similar attempts will be made during the next election. Only a few days ago, Kahinda Otafiire expressed a clear lack of commitment on the part of government to implement electoral reforms as recommended by the Supreme Court after the 2016 election. our participation in the next election. Those who have cast doubt that an election will take place at all in 2021 also have a point. As we know, ever since we massively defeated Museveni in Kyadondo East, Jinja-East, Bugiri, Rukungiri and Arua, he decided to illegally halt all by-elections in the new constituencies, because he could not contain the pressure caused by the wave. As we speak, because of the massive victories in the key guild elections in favor of People Power, several universities have been directed to disqualify People Power candidates. Where they have been nominated, the regime has deployed its cadres to bribe voters and interfere with the voting process. We are therefore mindful of all these factors- even as we call on you all to register as voters. WHAT THEN IS OUR STRATEGY? Firstly, we believe that the citizens of Uganda have a right and duty AT ALL TIMES to defend the Constitution of Uganda which Museveni has violated, abrogated with impunity and amended contrary to its provisions. It will be remembered that Article 3(4) of the Constitution bestows upon us, as citizens, the right and duty to do everything within our power to restore the constitutional order which has been violated- at all times. That is why we called upon you, the people of Uganda, to defend the Constitution when it was raped in 2017. That is why we have persistently mobilized peaceful assemblies to rally the masses against several violations. At a personal level, I have supported and continue to support any cause that is intended to bring down dictatorship in Uganda! That is why our team works every day to put an end to all injustices against our people- from extortionist taxes, unemployment, etc. Putting an end to bad governance is our business – first and foremost. In this regard, we are encouraged by the people of Algeria who in the past weeks forced a dictator to resign; and the people of Sudan who through peaceful protests forced a powerful despot to give way. While we are aware that our brothers and sisters in those countries are yet to achieve full freedom after their efforts are being hijacked by those who wield guns, we celebrate with them the victory of removing the biggest stumbling blocks in their path to freedom. We are encouraged by their example that it is possible for the most powerful of despots to come tumbling down in the face of People Power. On this point, we are in agreement with our comrades in the struggle who believe that action should be taken now. That is why we do not tire in strategizing, mobilizing our people through various activities, and making partnerships. These are all necessary steps towards empowering and readying the people to do all in their power to defend the Constitution. We are on course. But then the intelligent question to ask becomes- WHAT NEXT? If Museveni fell today, what would be the next step? The proper thing to do would be to demand for free and fair elections within six months as required by Article 109(2) of the Constitution. If you do not do this, you end up with the revolution being hijacked like has happened in many cases- and as we see presently in Sudan. But then, how would we participate in those elections within six months if the citizens did not register to vote? Even if we want to set up a transitional government, it should be born out of a democratic process. Those who followed the last election in Zimbabwe understand what we are talking about. Therefore this is the first point. The second point requires that we reflect on a few past happenings. We should all recall that dictators fall in different ways. The constant is that all of them eventually fall. I am sure that President Museveni, (seeing what has happened to his counterparts who were even stronger, more manipulative and wiser than him), is aware of the catastrophe that awaits him if he does not restrain himself. Dictators do not fall the same way. What we have learnt in the past is that some fall through popular uprisings before elections (Algeria, Sudan, Burkina Faso, etc), during or after elections (Ivory Coast, Gambia, etc), coups d’etat (Mali, Zimbabwe, etc), foreign intervention (Libya, etc), natural causes (Guinea Bissau, etc) or even through conventional warfare. A few who are wise enough read the signs and hand over power peacefully (Angola, etc). The sparks are usually different. The means and circumstances are usually different. The aftermath is usually different. The constant is only one- EVERY DICTATOR WILL CERTAINLY FALL. When we have not succeeded, we then go for elections. THE SAME LEADERS WHO HAVE DISCOURAGED ELECTIONS DECIDED TO PARTICIPATE IN THOSE ELECTIONS. The same leaders who have made it clear that Museveni cannot go by the ballot actually nominate as candidates and appear on the ballot! Many in the population which has been told that an election cannot work decide to shun the election process- thus explaining the millions who stay away on election day. Moreover, we go into these elections when we are not fully prepared for them. We participate in them as a ritual. For the past elections, the forces of change have failed to achieve UNITY which we all agree would do magic. We end up without a clear strategy to protect the votes. The population is not prepared enough to reject a rigged election- IN ANY CASE ELECTIONS WERE DISCOURAGED IN THE FIRST PLACE. Therefore, this is our point of departure from our friends who are discouraging our campaign to have our citizens register as voters, even as we work with other measures. I am persuaded beyond doubt that comrade Dr. Kizza Besigye has won at least two elections in the past and was rigged. But I also know that the win was not as decisive as it ought to be if we confronted the despot as a more united and prepared front. Because of the weaknesses I have highlighted, the citizens have not been able to come out and assert their sovereignty and claim their victory. For example, Dr. Besigye has indicated several times that he won with 52% in the last election according to the tally he put in place. I believe however that if a lot more had been done two or three years prior to the election (to unite the opposition, call upon citizens to register and rally them to vote, etc) the victory would have been much higher and therefore more difficult to tamper with. For example, in the 2016 election, close to 5 million registered voters stayed away from the polls. Many more adult Ugandans did not even bother to register in the first place. Why? Probably because they have been discouraged by the forces of change from having any confidence in the process. We must remember that dictators are better dealt with if defeated by a knock-out! Comrades, we should do everything possible to defend the Constitution and restore constitutional governance in our country. Adding to what we have been doing, we shall intensify our efforts- working with all forces of change. If we succeed before the next election like Algeria or Sudan have, the better for our country. But let us not lose sight of the constitutional and internationally recognized opportunity that we shall have in 2021. We cannot afford not to prepare for an election and then decide to participate when the population has been turned away from the process. THE LESSONS OF THE PAST 20 YEARS SHOULD HAVE MADE THIS CLEAR TO US. We can overwhelm Museveni in an election organized by his own Electoral Commission – it happened in Ivory Coast, it happened in the Gambia and many other examples. Should Museveni manipulate the laws and try to stop or extend the elections or even to prevent us from participating, that will be another conversation and we shall awaken the people of Uganda to do the needful. For now, I call upon all of you to REGISTER and get your National-IDs. Power to the millions of you who have responded to our call. We are making this case to all comrades in the struggle. We hope to persuade them to see our viewpoint because we believe that we are stronger when all of us are on the same page. A PEOPLE UNITED SHALL NEVER BE DEFEATED.